Charlie Wilson — He Of 'Charlie Wilson's War' — Is Dead : It's All Politics Former Texas Congressman Charlie Wilson — best known as the subject of the Tom Hanks movie, "Charlie Wilson's War" — has died. Former Rep. Charlie Wilson, a liberal Texas Democrat widely known in Washington as "Good Time Charlie" for his carousing and drinking -- and who became nationally famous a decade after he left Congress as the subject of the movie "Charlie Wilson's War" -- is dead. 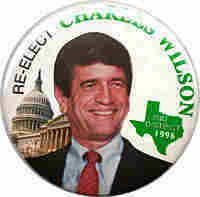 Wilson, who served 12 terms in the House and didn't seek re-election in 1996, was 76. A hospital spokeswoman in Lufkin, Texas, said the preliminary cause of death was cardiopulmonary arrest. One of the most distinctive figures in the House -- tall, almost spectrally thin, flamboyant, pleasure-loving -- yet he is also serious-minded when he wants to be, and even idealistic. He was all that, and more. Everyone had a favorite story of visiting his office in the Rayburn House Office Building and being met by beautiful female staffers, one more stunning than the next. At the same time, Wilson -- who was divorced and never apologized for his fondness of women -- was a serious lawmaker, especially on the issue of aiding the Afghan rebels in their battle against Soviet occupation, beginning in 1979. He traveled to Afghanistan, Pakistan and South Asia numerous times, and he often worked, secretly, to add funds for the rebels that would not be detected in official appropriations documents. On one trip to Afghanistan, he famously lashed out at the Defense Intelligence Agency for refusing to allow a former Miss World to accompany him. Against the rules, the DIA said. I'm cutting your budget, Wilson responded. The New York Times once asked him what he thought about all the new female lawmakers who had been elected to Congress. "I love it," he replied. "A couple of 'em are pretty cute." While his comments about women made many wince -- and would hardly be shrugged at today as they were back then -- he always had good, professional relationships with the Democratic women he served with. And while his voting record was reliably liberal -- he was a strong supporter of abortion rights and providing for unpaid family and medical leave -- he was a consistent opponent of gun control. He also opposed lifting the ban on gays in the military. His social life and efforts on behalf of the Afghan rebels became the subject of the 2007 film, which starred Tom Hanks as Wilson. In 1972, the longtime incumbent for the 2nd District, Democrat John Dowdy, decided that it would not be a good idea to seek re-election, especially after his conviction for bribery, conspiracy and perjury. Dowdy's wife decided to run for the seat, to vindicate her husband's name. But she was no match for Wilson, a liberal from Lufkin who had solid support from black voters. He won the Democratic primary easily. In his later years in the House, Republicans began in earnest to try and defeat him but they never succeeded. The closest they came was in 1990, when Donna Peterson, a pro-life West Point graduate, held Wilson to 56 percent. She ran against him two more times, with the same result. When Wilson retired in 1996, he was succeeded by a fellow Democrat, state Sen. Jim Turner. But though their political parties were the same, the two men were quite different. Turner was a Sunday school teacher and a deacon in his church.